Prospective buyers can obtain a current list of Foreclosures and Short Sales by clicking on the request link at the bottom of this page. At this point in the real estate market cycle on Hatteras Island, it is a good time to update the trends that we are seeing with regard to foreclosures and short sales. An awareness of the role that distressed properties are playing in the overall market is important for several reasons. First, buyer expectations of the availability of great deals need to be adjusted to reflect present market conditions. Second, a noticeable decrease in the level of distressed properties in the current inventory is a signal that market dynamics may slowly be shifting in favor of sellers. Third, the changing balance in the market between distressed and non-distressed properties is a pre-condition for selling prices to start rising once again. The following graphic shows the 32.8 percent decline that has occurred in the number of foreclosure filings between 2009 and 2011. If the present pattern continues, foreclosure filings will be down again this year. The next chart depicts the changes that have occurred in both the level and the mix of distressed property sales in 2011 and year to date in 2012. 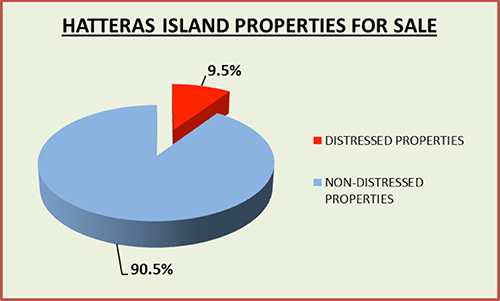 In total, foreclosures and short sales represented 55.6 percent of all sales transactions on the island in 2011 and 51.4 percent of sales through September of this year. As you can see, distressed property sales, while slowly declining, still represent over half of all transactions. Keep in mind that these statistics reflect past history and are, therefore, somewhat like looking in the rear view mirror. What the future holds is perhaps the more relevant understanding that we should be seeking. Properties under contract give us some idea of current purchasing behavior. Presently, short sales represent 48.1 percent of the houses and lots under contract, but bank-owned properties account for only 9.0 percent of the total. This pattern may reflect the fact that buyers have in the past shied away from short sales because of the associated delays and uncertainties and have favored foreclosures because of lower prices and smoother transactions. As the number of available foreclosures has decreased, buyers may be more willing to consider short sale properties because of their price advantage over non-distressed properties. Where we really see the impact of the diminishing role of distressed properties is in the inventory of homes and lots that are presently for sale. Out of 400 properties that are available for purchase, only 20 are bank-owned and 18 are short sales. This equates to just 9.5 percent of the total number of properties for sale. By presenting these observations, we are not suggesting that foreclosures and short sales are going to disappear any time in the near future. What we are saying is that the number of distressed properties relative to the total inventory of properties can be expected to play a much smaller role in the future than they have over the past few years. As buyers search for homes and undeveloped lots to make their dreams of owning a place at the beach come true, they would be well-advised to look for properties that are priced appropriately for current market conditions and not be too disappointed if they dont find some of the bargain basement prices that we have seen during the height of the buyers market. As many as 70 percent of homeowners are estimated to be going into foreclosure without taking any visible action to prevent or delay this outcome. Many believe that recently enacted federal legislation will rescue them. The unfortunate fact is that this is probably not going to happen, especially where second homes and investment properties are involved. It is a common misconception that lenders are eagerly awaiting the opportunity to take over homes in distress. Nothing could be further from the truth. First, the lender does not want to own the real estate. Second, foreclosing on a property is an expensive proposition for a lender. Third, having a foreclosed property on the banks books has regulatory implications. Finally, under current real estate market conditions, the lender may be taking back an asset that is declining in value. Each state has its own foreclosure laws and procedures. In North Carolina, the entire process from the first missed payment to the actual foreclosure can take anywhere from several months up to two years. It is generally agreed that a homeowner should make every effort to avoid foreclosure. There are very serious and long-lasting implications of foreclosure including credit impacts, ability to qualify for a future mortgage, potential employment and security clearance ramifications, and possible tax consequences. At the first sign of financial trouble, homeowners are advised to immediately contact their attorney, their accountant, and a Realtor who is knowledgeable about working with distressed properties. Foreclosure is the alternative of last resort for both the homeowner and the lender. The good news is that there are often options available to prevent or delay foreclosure for homeowners who find themselves in a financially perilous situation. Misinformation and lack of knowledge cause homeowners to make the wrong decisions which, in turn, can make their situations worse. We invite you to request a copy of our free report, Ways to Delay or Avoid Foreclosure, by clicking on the request link at the bottom of this page. One alternative to foreclosure, known as a short sale, is often a viable solution for the owners of both primary residences and vacation homes. By definition a potential short sale situation exists when a borrower owes more on their home, including closing costs and expenses, than the current market value of their property. You may also have heard this set of circumstances referred to as a seller being upside down or underwater. A short sale occurs when negotiations result in the lender agreeing to accept less than the full balance owed on the property owners loan(s). While the concept of a short sale seems simple enough, the reality is that the process has many dimensions, and it can require a lot of patience, communication, and understanding by all of the parties involved. It is important to recognize that a short sale is not a get out of my mortgage free pass for anyone who owes more on their mortgage than their property is worth. A short sale is a way to avoid foreclosure. The seller has to either be in foreclosure or headed toward foreclosure. There must be a demonstrated financial hardship associated with the borrowers inability to pay their mortgage, and the owner must owe more on their mortgage than the propertys fair market value. If these pre-conditions do not exist, then the homeowner basically has an investment that did not work out as planned. These individuals will usually have to wait for the market cycle to recover, bring cash to closing to pay the difference between the mortgage balance and the selling price, or, in the worst case scenario, allow the property go into foreclosure. An essential part of conversations that the homeowner has with their advisors is understanding the potential consequences of a short sale. For example, depending on a variety of factors, the borrower may remain liable for the difference between the mortgage balance and the proceeds of the short sale (deficiency judgment); there may be income tax ramifications; the owners credit score may be impacted; and, the homeowner could be asked to sign a promissory note for the difference between the loan balance and the proceeds of the sale. Once it has been decided that a short sale is the best option to pursue, the property is listed for sale with a real estate broker, and the marketing process begins. After an offer to purchase is received, the offer together with a rather extensive short sale package is submitted to the lender. It is the lender, not the seller, who ultimately decides whether or not to accept the purchase price in the buyers contract. Because of the high volume of distressed property related files that lenders are processing and the associated backlogs, it can take anywhere from several weeks to several months for the lender to make a decision. This inherent delay is a major reason that it is so important for there to be open communication among all of the parties in the transaction about the short sale process and the need for patience and understanding. The end result can be beneficial outcomes for everyone involved. A copy of our free report, Short Sale An Alternative to Foreclosure, may be obtained by clicking on the information request link below. Tom has been awarded the professional designation of Certified Distressed Property Expert (CDPE). We understand the processes of short sales and foreclosures. Equally important, we are empathetic to the fact that distressed homeowners are experiencing one of the most painful financial situations that they have ever encountered. Some buyers and investors may be hesitant to consider properties that are identified as foreclosures or short sales because they have concerns about benefiting from another persons financial misfortune. The reality is that by purchasing a distressed property, the buyer is helping the homeowner, assisting the lender, probably obtaining the property at a favorable acquisition cost, and, in a very real sense, making a meaningful contribution toward resolving the current housing market dilemma by reducing the inventory of unsold homes. Use our information request screen to order one or more of our essential foreclosure and short sale reports. Contact us today!